According to Historians, hundreds of years ago village Rudrapur was established by a devotee of lord Rudra or by Hindu tribal chief called Rudra, which has passed through phases of development to take the shape of city Rudrapur. The importance of Rudrapur has increased as it is the head quarter of district Udham Singh Nagar. During the reigns of mughal emperor Akbar this land was handed over to king Rudra Chandra in 1588. The king established a permanent millitary camp to free tarai from day today invasions. Totaly neglected village Rudrapur was filled with new colours and human activities.There is a saying that Rudrapur was named after king Rudra Chandra. During the reigns of Britishers, Nainital was made a district and in 1864-65 the whole Tarai and Bhawar was put under “Tarai and Bhawar Government Act” which was governed directly by the British crown. The history of development started with 1948, when the problem of partition brought refugee problem with it. Immigrant from north west and eastern areas were reestablished in 164.2 square km land area under “Up Nivesh Yojana”. Personal dwellers were not allotted land in accordance with crown grant act. The first batch of immigrants came in December 1948. People from Kashmir,Punjab,Kerala,Eastern UP,Garhwal, Kumaon,Bengal, Haryana,Rajasthan, Nepal, and South India live in groups in this districts.This country is an example of unity in diversity with people from many religions and professions and so is this Tarai, which has its heart at Rudrapur. Due to this Tarai was named MINI HINDUSTAN. According to a folktale when king Rudra was passing through, his chariot got stuck into marshy land, so he decided to build a temple and well at that place. 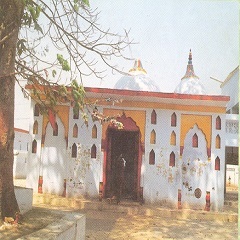 The present Atariya temple is the same At a distance of 2 kms. from the bus stand and half a kilometre away from the Rudraur-Haldwani motor route. Every year during the occasion of ‘Navratras’ a large fair is held here and thousands of devotees come to seek the blessing of Goddess Atariya. The fair is held for 10 days.